This upper-intermediate ESL lesson plan focuses on teaching the correct usage of the second and third conditionals. It includes a lead-in activity, several classroom exercises and a game. And don't forget, if you use an iOS or Android device, you can get offline access to these materials through the TEFL Handbook app. 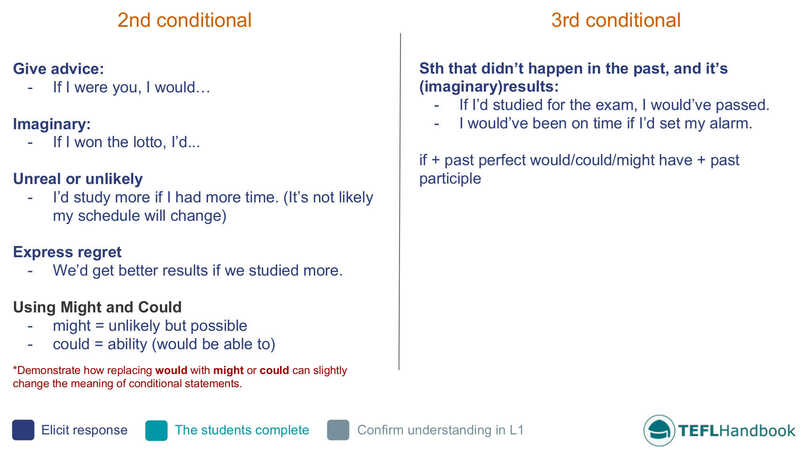 Compare and contrast the functional uses of the second and third conditionals and try to elicit examples of each. Students work to create a list of interview questions for their partner that use conditional structures. First, students will work in pairs to decide if future events are probable and improbable for their partner. 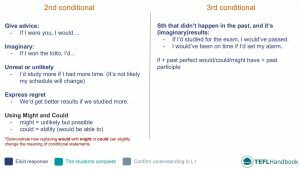 Depending on their decision, they will then create a list of interview questions for each one using the correct conditional tense. Add the following future events to the board. 1. Improbable - What's the first thing you would buy if you won the lotto? 2. Probable - Where would you go if you went clothes shopping this weekend? Students who finish early should compare their work with their partner's and discuss any differences. When everybody has finished, ask the students for their solutions and correct any mistakes as a group. In pairs, the students will now take turns interviewing each other using the questions they made during the previous activity. Before they begin their interviews, remind students that this is upper-intermediate level and that they should ask follow-up questions to generate discussion. You should demo this with another student to give them an idea. Students will work in pairs to create third conditional statements from prompts. Add the following style of prompts to the board. Also, encourage them to use contractions for 'would' and 'had'. 1. If we hadn't overslept, we wouldn't have missed our flight. 2. I'd have got you a ticket If I'd known you liked Jay-Z. 3. She'd have called you if she had her mobile phone. 4. He definitely would have remembered if you'd told him. 5. If they'd practised more, they wouldn't have failed their exam. 6. They wouldn't have stolen my car if you hadn't forgotten to lock it. Students have to summarise an online article on preventable disasters. Tell your students to do an online search for 'Disasters That Were Foretold' and read the article by The Atlantic. It talks about several disasters over the past 30 years that were somewhat preventable. If you have time, elicit some guesses from your students about what they might be and discuss. They should summarise the article in the context of what could have been done to prevent each disaster. Don't forget to read the article before the next lesson. It's also a good idea to prepare some questions for a group discussion. A role-playing game where students pretend to be part of a post-disaster press conference. This is a fun game idea that can be used to practice question formation, and how to divert blame and make excuses. For each round, assign one student to be the speaker. They will be acting as the public face of a massive disaster. Before the press conference begins, give the students a few minutes to think of questions that they believe the press would ask. The speaker must prepare to anticipate these, deflect blame, give plausible excuses and defend them under scrutiny. When the press conference begins, the speaker stands up and takes questions from the press. Just like in a typical press conference, journalists must wait until the speaker signals for them to ask their question. At the end of the press conference, choose a winner based on performance. The next free lesson plan in this series is on using intensifiers. If you've found these materials useful, be sure to check out our full list of upper-intermediate ESL lesson plans. For other levels, have a look at our complete selection of EFL - ESL lesson plans.